Very nice home! Someone did an awesome job renovating it. Looks great! Nice renovation, clean and cozy! Great job. This is just. Excellent. Envious beyond belief. 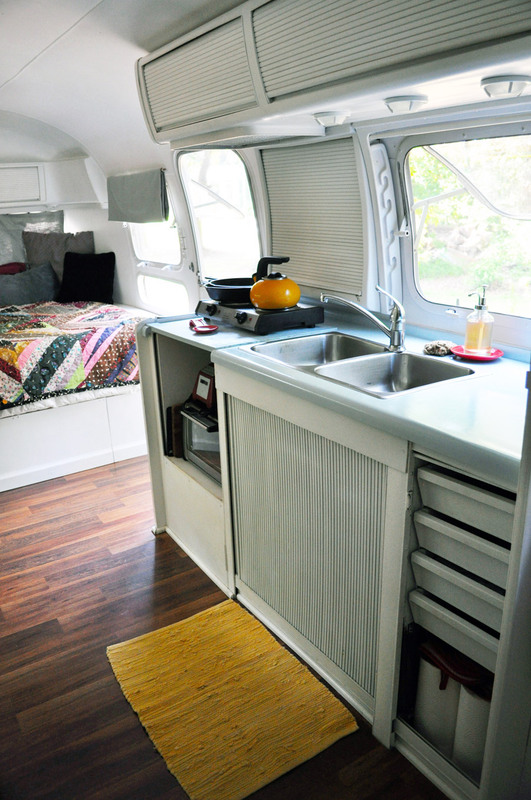 Cute, clean and comfortable in the Carolinas. A cool looking classic! Absolutly awesome! 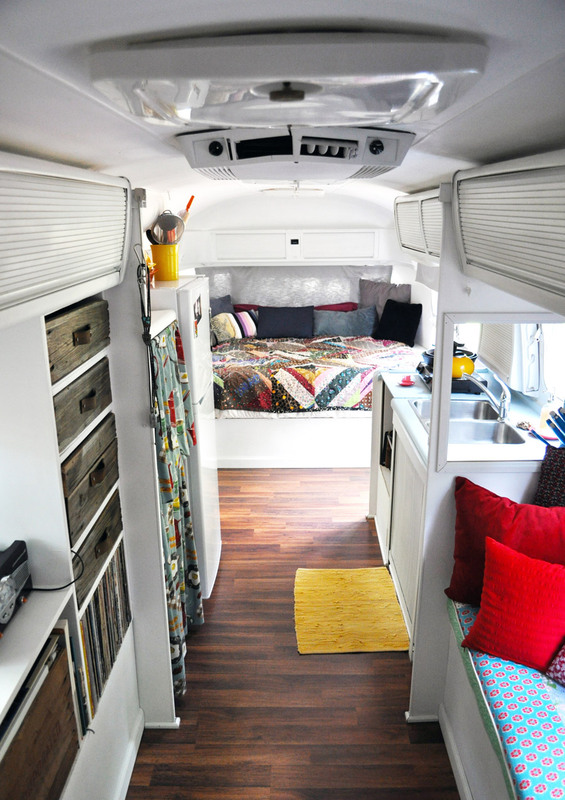 I have lived in two similar trailers, but neither so nicely done. Thank you for sharing. It’s a dream, isn’t it?!? Pure beauty, all inclusive. Good for you. It looks fabulously well done. Mind you I have not seen an air stream that wasnt well done – something about air-stream owners. 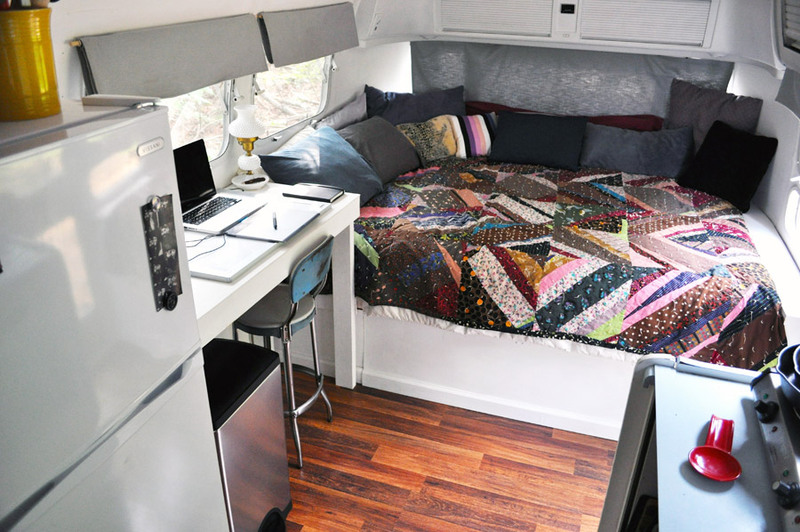 I especially love the quilt. I hope you have a very happy life together in your dream-stream. I agree, I love that quilt!! If the owner sees these comments, I’d be curious to know if it’s handmade/where they got it. Awesome! I’m curious how you handled insulating when renovating. 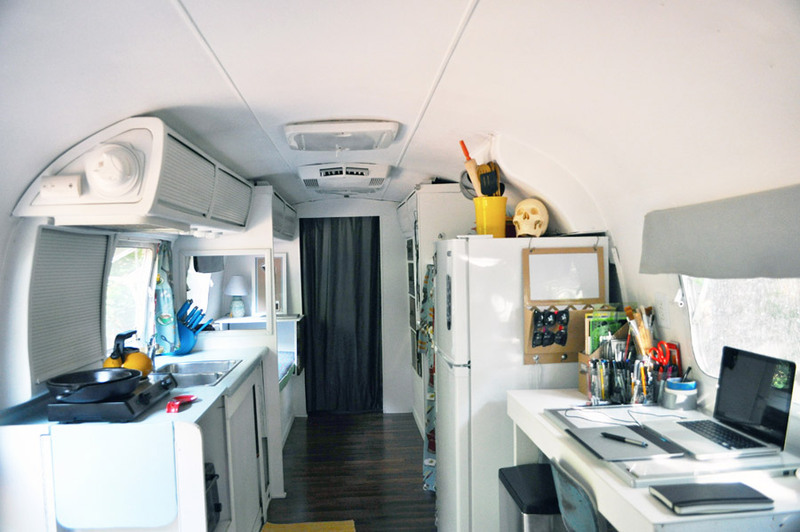 I’ve considered an Airstream re-do, but keep hearing about the inadequate insulation. Can this be fixed? I love the size of the kitchen and bathroom areas. 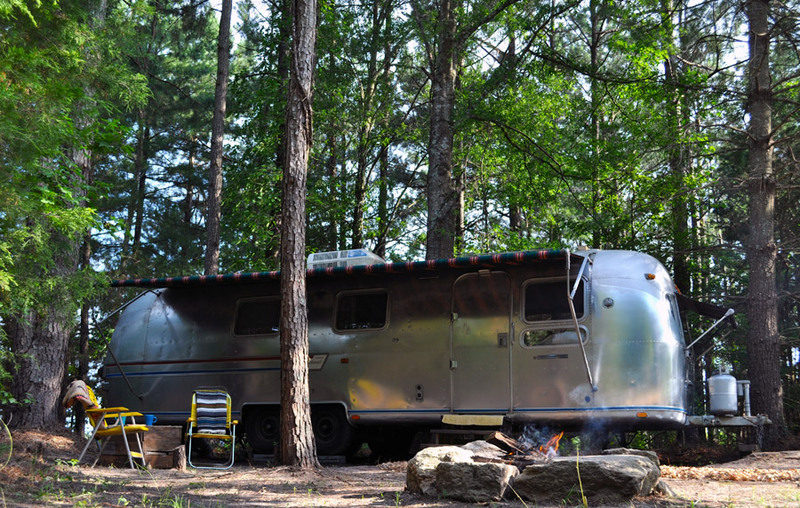 Don’t know if that’s typical for Airstreams. Is that vinyl on the shelves? We are in the process of renovating one, and have pulled out everything, down to the shell. We threw away the old insulation and will be installing new insulation and wiring. I love all the retro touches, especially the record player, shabby chic drawers, and bathroom wallpaper! Love love love this. Perfect wouldn’t change a thing. When can I move in? Bathroom is ab-fab. Curtains with Bacon & Eggs….so cute I want the same fabric! Exceptional lay-out, very user and body friendly. I can easily see two people and a pup living their day-to-day lives in this home. I also wanted to add (no EDIT button here) that I really appreciate your “re-purposing” an existing structure. 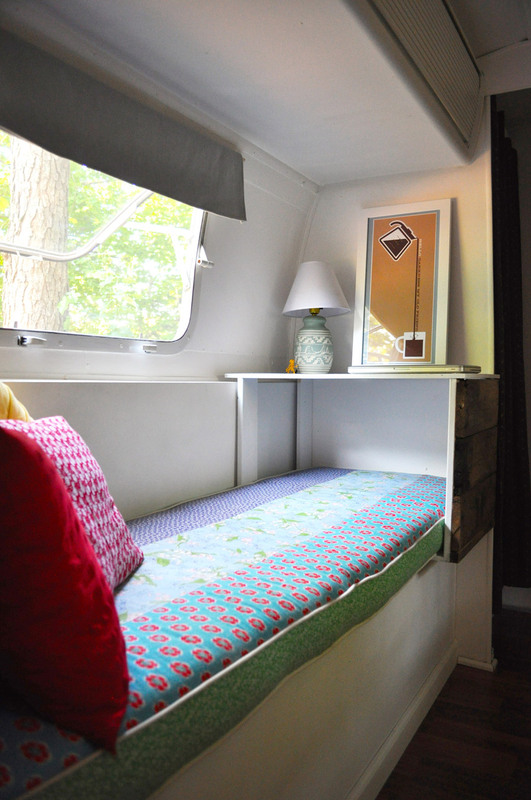 For the life of me, I’ll never understand why someone would pour a fortune into a stick-built tiny house when they can spend 1/2 of that money to either retro-fit a trailer or if they have no skills, buy one from a talented person. 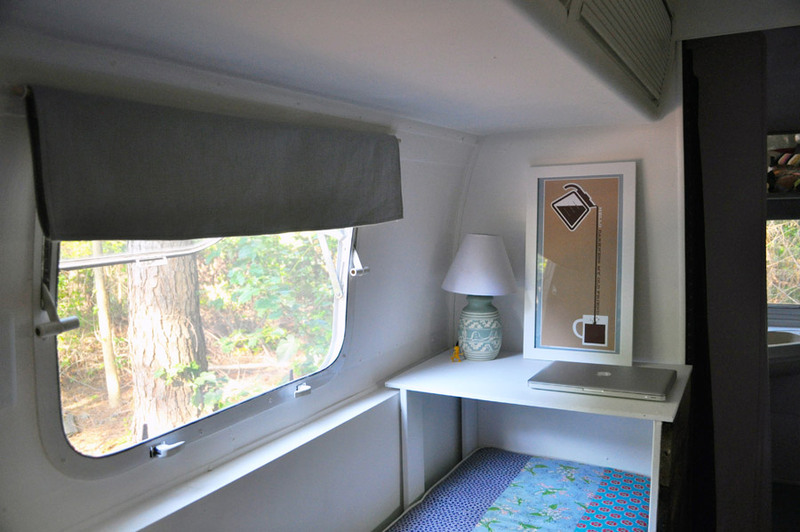 If I were to go tiny, I’d mimic what you did and capitalize on the beauty and efficiency of trailer living vs. most of the silly waste of space I see in too many stick built tiny houses. I LOVE this one!!! I especially appreciate when someone has a real feel for interior design in small spaces…keep it funky and fun while repeating just a couple of vibrant primary colors throughout. Nothing wrong with wild patterns and creativity (in fact, that’s so much more interesting), but the repeat of just a couple of colors popping up unexpectedly ties the whole place together without either being visually assaulted by too many colors and patterns, or – even worse in my opinion – being bored by a lack of any daring choices that leaves the place too matchy-matchy, like a Pottery Barn photo spread. 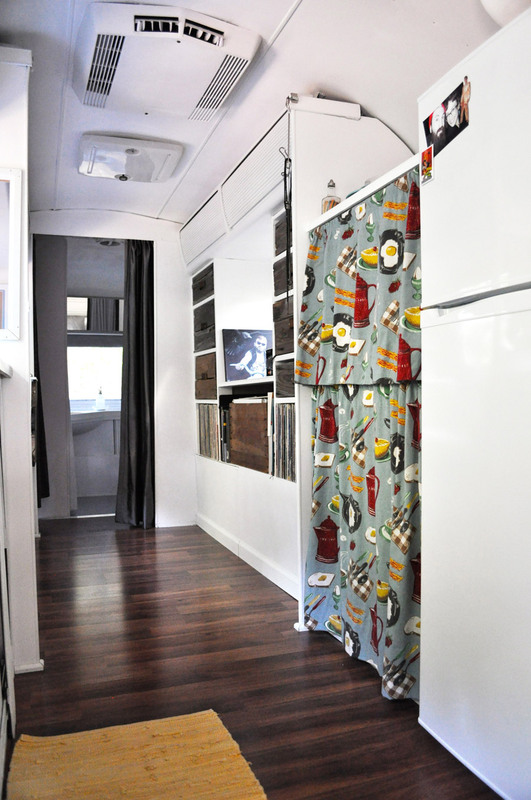 I would never comment negatively about someone’s tiny home based on a disagreement about their personal choices or taste (as many others do on this site), but I did feel compelled to gush over the funky eclectic yet tasteful combo here. Loads of vinyl, PLUS bacon & eggs? Love love love!!!! Love it! I second Denise’s comments. What a lovely interior with some really unique touches. I love the coffee poster, but it’s all great! It makes me want to know you. 🙂 Congratulations. Hope to follow in your footsteps someday. Love the white interior and the fact that the vintage wallpaper in the bathroom will enjoy a new “life” with the new owners. They are living the dream! Best of luck.